a Dozen Long Stemmed Roses made with a precious metal – platinum. Twelve long stemmed roses are a traditional and heartfelt way to say “I love you” or “Thank you” – at Christmas and all year long. Our romantic bouquet is arranged in an exquisite ceramic vase which is texture change to match any home decor. The lovingly sculpted roses and gypsophylla are arranged to look good from all sides, and are accented with green foliage. The gently rippling water surface adds to the bouquet’s realism. Also included is an optional pedestal display table, pictured in the product image below. 4 solids and 4 textured looks. And since the product is modify (except the scripts), you can also recolour the textures. The menu also includes Access Control, so that you can allow others beside yourself to change the look of the arrangement. -Hanaya- Dozen Long Stemmed Roses (Platinum) are now available for sale at our in-world store, as well as on the Second Life Marketplace for gifting or home shopping for yourself. 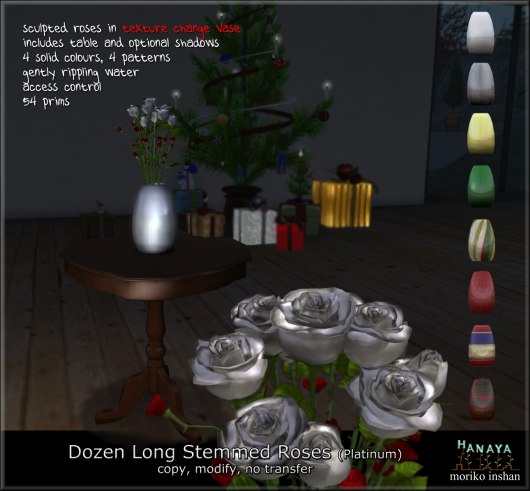 This entry was posted in Product Announcements and tagged -Hanaya-, Christmas, festive season, roses, texture change on November 14, 2012 by moriko.